Lake Ozark, MO /5 Bedrooms / 5.5 Bathrooms / Lakefront Home / Four Seasons Area / Close to Golf. 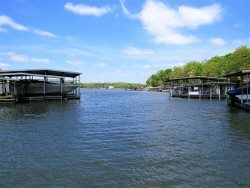 If you’re searching for the perfect vacation home in the desirable Village of the Four Seasons area of the Lake of the Ozarks, this is the one for you! This beautiful home is located at the mouth of 6 Mile Marker and has an unbelievable view of the main channel. The house backs to the east to make afternoon grilling and family activities cool and shady. With 4,000 square feet, 5 bedrooms, and 4 ½ baths on two levels, there is plenty of room for family gatherings, corporate events, or golf vacations. The main floor living area boasts ceiling to floor windows with views of the 44 ft. deck and main channel. Relax in one of the two sitting areas, watch your favorite movie or sporting event on the 50” smart TV, or enjoy a glass of wine in front of the wood-burning fireplace on those crisp spring and fall evenings. A gourmet kitchen and dining area open to the deck with two separate eating areas (one with a ‘fire pit’ dining table) and a new gas grill. The large main floor master bedroom enjoys massive windows to view the deck, lawn and lake. The master bath has a whirlpool garden tub and separate shower. For your convenience, there is a separate laundry room. The 2-car garage with 2nd refrigerator/freezer is available for your use as well. The lower level has 4 bedrooms, an open living area with 2nd wood-burning fireplace, a 50” smart TV, game table, bar area, and Ms. Pacman machine. The dry sauna is a perfect ending after time on the elliptical or rowing machine in the separate window-surrounded workout room. All rooms open to the lower 44’ covered deck with seating and dining areas leading to the gently-sloping lawn and brand new dock. For outside fun, the dock has a 12’ x 42’ covered boat slip with tie downs for your boat and a separate slip with lift for your personal watercraft. Enjoy family activities or just relax on the large swim platform. Sit at the bar-level table to eat lunch or have a cool drink between boating adventures! Too rainy or cold to enjoy the many amenities outside? There are 4 TVs, Ms. Pacman, and plenty of games for young and old. This beautiful lake-front home is located just minutes by car from the Four Seasons golf courses, community pool, and lake area attractions. A playground for the kids is within walking distance. Lakeside dining at H. Toads and Shady Gators is minutes away by land or water. Fuel up your watercraft while you’re there. The best restaurants, shopping, and entertainment in the area are just minutes away. You’ll want to share this beautiful home with your family and friends year after year…. spring, summer, fall or winter! Oh, and yes we welcome your pets!